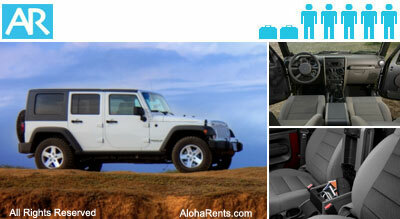 We now offer the 4 door Jeep Wrangler Unlimited with room for 5 adults. The interior is well designed and larger than a typical two door Jeep Wrangler. The additional luggage space is much appreciated in this Jeep model. The average mileage for this Jeep is between 22/24 MPG. Four speed automatic transmission, tilt wheel, cruise control, central locking system, power steering, windows and brakes, 4 doors, A/C. Every four door Jeep includes a six speaker sound system with AM/FM stereo and MP3/CD player. Yes, there is at least one USB outlet in the center consol. Bring your own USB if you want to use the cigarette power outlet. Jeeps, (Wranglers / Cherokees) and especially our new 4 door Wranglers are in high-demand, especially during peak-seasons. We encourage you to book early and avoid availability issues. All of our vehicles include unlimited mileage!